At the very centre of the Solar System is the Sun. The Sun is a star, a massive ball of gas which produces huge amounts of heat and light. It is the key reason why the planets in the Solar System are present, and why life on Earth is able to exist. Without the Sun, there would be no light, no warmth, no water, no plants, animals or people. The Sun is a star and isn't much different to the millions of other stars in the sky. The reason it appears so much bigger and brighter than other stars is because it is so much closer to Earth than they are, being only eight light minutes away from Earth. This means that it takes eight minutes for the light from the Sun to reach Earth, meaning that when you look at the Sun, you are seeing it as it was eight minutes ago! Although the Sun is the closest star to Earth, it is still a long long way away, being nearly 150 million kilometres away (about 93 million miles). It is also more than ten times wider than Earth which could fit into it over one million times. The fact that it provides so much light and heat to Earth from that distance shows how huge and powerful it is! The nearest star after the Sun is Proxima Centauri, 4.3 Light Years away, or 40,000,000,000,000 kilometres away! (25,000,000,000,000 miles), so, if we were to see that star in the sky, we would be seeing it as it was over four years ago. Earth and the other planets in the Solar System spin around the Sun, kept in its orbit by its strong pull of gravity. Each time a planet has travelled around the Sun and has returned to where it began, a year on that planet has passed. It takes just over 365 days for Earth to spin round the Sun, so a year on Earth is 365 days long. A year on Mercury, the planet closest to The Sun, is only 88 days long, but a year on dwarf planet Pluto, millions of miles away from the Sun, is as long as 248 earth years! 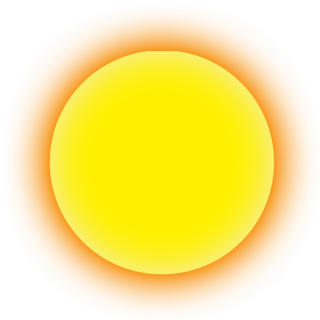 Although the Sun looks like a perfect bright yellow sphere, there are sometimes a number of dark spots on it. These are sunspots, areas where the Sun's temperature is coolest, roughly between 2,700 °C to 4,200 °C (4,900 °F to 7,600 °F). Usually the Sun's surface temperature is about 5,500 °C (9,900 °F), and is much hotter inside! To imagine how hot that is, temperatures on Earth never really exceed 50 °C (122 °F), and the average temperature around the planet is about 15 °C (59 °F).